Leader of the Islamic Revolution Ayatollah Seyyed Ali Khamenei says the US seeks to expand its military presence in the Middle East region by declaring war on the Takfiri ISIL terrorists. 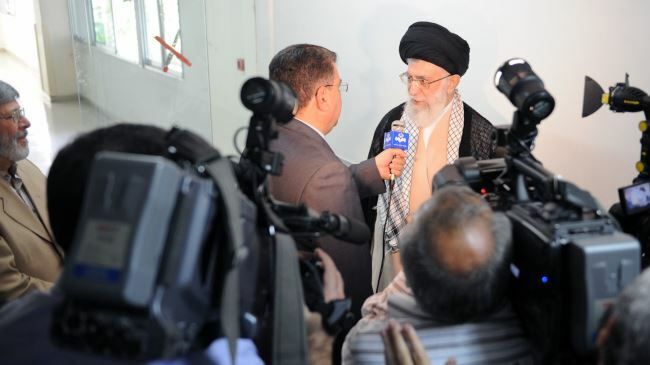 Ayatollah Khamenei made the remarks on Monday after he was discharged from hospital following a successful surgery. He was hospitalized last week at one of Tehran’s public hospitals and underwent a prostate surgery. The Leader described as “absurd, hollow and biased” remarks made by US officials regarding the formation of a so-called international coalition to battle the ISIL terrorist group. Ayatollah Khamenei noted that there is ample evidence of US officials’ contradictory allegations with regards to inviting Iran to the international conference currently underway in France, aimed at countering the rising threat of ISIL. “During the difficult days that ISIL attacked Iraq, the US ambassador to Iraq submitted a request to our ambassador to Iraq calling for a meeting to be held between Iran and Iraq for negotiation and coordination on [the issue of] ISIL,” the Leader said. “Now they are falsely claiming that ‘we will not let Iran be part of the [anti-ISIL] coalition’, while Iran had voiced its opposition to being a party to that coalition from the very beginning,” Ayatollah Khamenei stated. The Leader further hailed the efforts made by the Iraqi nation and army in battling the ISIL Takfiri terrorists, noting that this was Iraqi army and nation, and not the Americans, who crushed the ISIL in Iraq. The Paris meeting is being held as the US is forming a so-called international coalition to battle the Takfiri ISIL militants. The ISIL terrorists control large parts of Syria’s east and north. ISIL also sent its Takfiri militants into Iraq in June, seizing large swathes of land straddling the border between Syria and Iraq.